"We will not be satisfied until justice rolls down like waters and righteousness like a mighty stream." --Martin Luther King, Jr. The March on Washington for Jobs and Freedom or "The Great March on Washington", as styled in a sound recording released after the event, was one of the largest political rallies for human rights in United States history and called for civil and economic rights for African Americans. 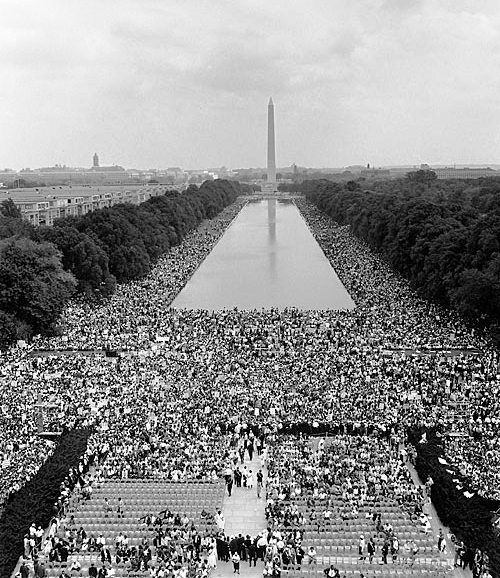 It took place in Washington, D.C..Thousands of Americans headed to Washington on Tuesday August 27, 1963. On Wednesday, August 28, 1963. Martin Luther King, Jr., standing in front of the Lincoln Memorial, delivered his historic "I Have a Dream" speech in which he called for an end to racism. 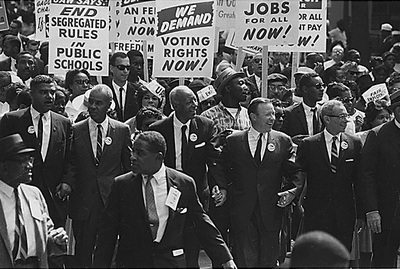 The march was organized by a group of civil rights, labor, and religious organizations, under the theme "jobs, and freedom". Estimates of the number of participants varied from 200,000 to 300,000. 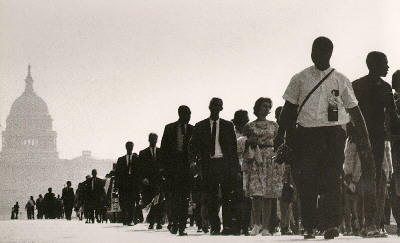 Observers estimated that 75–80% of the marchers were black. The march is credited with helping to pass the Civil Rights Act (1964).